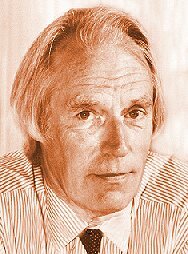 In 1971, about a year after the breakup of the Beatles, George Martin did an interview with the British music magazine Melody Maker in which he talked about many of the Beatles songs, their recording processes and influences, album makings, and what it was like to work with the band. The interview was presented in three parts, all of which are presented here. MM: Do you remember how the Beatles came to you and EMI? MARTIN: Oh yes, very easily. Brian Epstein brought them to me, not to EMI ... well, he had already taken them to EMI, and they'd been turned down. I didn't know that until afterwards. MM: Who turned them down? MARTIN: The story is that first of all he took them to a guy who was the marketing manager - I don't think I'd better mention his name - and he played the tapes to two producers. Now there were four producers at EMI at the time: Norrie Paramour, Norman Newell, Walter Ridley, and myself. Two of those four heard the tapes, and I didn't, so one of the other three is innocent! They said they weren't any good, so Epstein went away and played them to Decca, who showed an interest in them and brought them down for a test. It was fairly favourable to begin with, then later on Brian found out that he'd got to bring them down for a second test while Decca made up their minds, and he got rather shirty about it. He'd tried with other companies as well. I think ... Pye, and Philips. 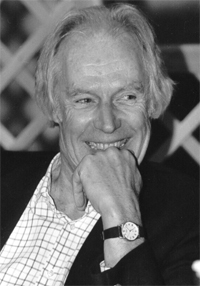 In desperation he took the tapes to HMV in Oxford Street to get some lacquers cut, because he wanted to place the songs with a publisher, and the engineer there, Ted Huntley, thought the tapes were great. He took them upstairs to Sid Coleman, who ran EMI Publishing, and Sid liked them too and said "Have you played them to EMI?" Brian said yes, but nobody wants to know, and Sid told him to play them to me, because I was looking for something. Brian brought them round to me, and that was that. MM: Can you remember the songs on that tape? MARTIN: No ... I can remember "Your Feets Too Big" was one of them. There was a motley collection - I think possibly "Love Me Do" was on it, but I'm not sure. Certainly the songs didn't knock me out - in fact I wasn't knocked out at all, in defence of all those people who turned it down, it was a pretty lousy tape, recorded in a back room, very badly balanced, not very good songs, and a rather raw group. But I wanted something, and I thought they were interesting enough to bring down for a test. I said, "Bring them down from Liverpool - I don't want to go up there and I'll have a look at them in the studio." 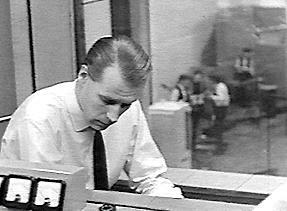 Obviously, Brian inwardly groaned, thinking he was going through the same thing as Decca, but they came to London and I spent an afternoon with them in No 3 studio in Abbey Road. I liked them, I liked them as people apart from anything else, and I was convinced that we had the makings of a hit group but I didn't know what to do with them in terms of material. MM: There was a kind of hiatus in pop at the time - were you conscious of that? MARTIN: Very much so. I was very envious of Norrie Paramour who had Cliff Richard, the big star. I'd been making comedy records - Peter Sellers, Charlie Drake, Bernard Cribbens - and I'd done it because I enjoyed it anyway. It was a way of giving Parlophone something different, and it was successful so I became the Comedy King. I envied Norrie his success with Cliff, because every comedy record you made was a oncer, you had to start from scratch the next time around. Whereas if you had an artist like Cliff, once you'd got him up there all you'd have to do was find a reasonably good song and give it to him, and you'd got a second hit. This, to me, was much easier, at least I thought so, and I was always looking fore something of that sort. When the Beatles came along I thought well, I didn't know where I was going to get the songs from, but they seemed a pretty good group and they seemed to have that kind of raw sound that people hadn't heard about yet. MM: What was it that was different - the raw sound, and the fact that they were a group rather than a solo singer? MARTIN: Well, I didn't recognise that, because the tapes weren't like that. They were occasionally singing together, but mostly they were alternating: sometimes it was John, sometimes Paul, and sometimes George. In fact my first sessions with them were looking for the voice. I thought they're great people, but who am I going to make the lead voice? I spent an afternoon with each of them in turn. I chucked out George pretty quickly, so it was left to either Paul or John. MM: Were all three singing equally when they came to you? MARTIN: They were doing all those rock standards, "Chains" and "Anna" and so on, and they were doing them the way they heard the records, imitating the records. So they were singing together, but occasionally one would burst out in solo. Then it suddenly hit me that I was being stupid - I was looking for a solo voice when I didn't need to, I should just take them as they were. Then we got rid of Pete Best, and Brian brought Ringo along. I was rather suspicious of him. MM: What was wrong with Pete Best? MARTIN: He was the best looking of the group, which was rather curious, but he never joined in with the others. He was always a bit quiet, almost surly. But the basic thing was that I didn't like his drumming, it wasn't solid and he didn't bind the group together. I said to Brian that I didn't want to use him on the records, although he could do what he liked with him outside the studio, as part of the group, but there was no reason why I shouldn't use a session drummer. No-one was going to know. This was obviously the trigger, because the boys had been thinking of getting rid of him anyway, but they wanted someone to do the dirty work for them. MM: What did you think of Ringo's drumming when you first heard him? MARTIN: I didn't give him a chance, to begin with. He suddenly turned up an a session - I didn't know he was coming and I booked Andy White, and I said well Andy's here and he's paid for, so he's going to play .. you can join in on tambourine if you like. MM: This was the "Love Me Do" session. MARTIN: Yes, we actually did it again with Ringo playing drums, because when I heard him he was much better than Pete Best, he gave it more solidarity, and in fact he was more raucous than Andy White, and it fitted the group anyway. He was pretty rough in those days, but pretty good. MM: So did he actually play on that single? MARTIN: Oh yes. But we had two versions of "Love Me Do," and in all honesty I can't remember which was which. I think maybe the one that Andy played on was on the album. MM: When you first met them, did you consider them seriously as musicians at all? As guitarists or composers? MARTIN: As composers, they didn't rate. They hadn't shown me that they could write anything at all. "Love Me Do" I thought was pretty poor, but it was the best we could do - they hadn't got anything else, and I hadn't got anything else to offer them either. As players they were quite adequate - they could play guitar pretty well and they had an uninhibited sound. The question of them being deep minds or great new images didn't occur to me - or to anybody, or to them, I should think. It was after we made "Love Me Do" that I was determined to find a hit song for them. I was scouring the publisher's office looking for material on our group, which nobody wanted to know about. EMI heard the Beatles, which they thought was a silly name anyway, and they didn't attach too much importance to it. "Comedy man tries to get into pop field," you know. We hit number 17 in the chart, which raised eyebrows but only just, so I found them this song by Mitch Murray which I thought was just ideal for them to learn for the next session. When they turned up on the session they said they didn't like it. MARTIN: "How Do You Do It." They actually recorded it but said they'd rather do one of their own numbers. I said that I hadn't heard anything of theirs that was any good, so they did "How Do You Do It." John sang the solo, quite well actually, but he came to me and pleaded with me. He said "Look, I think we can do better than this. If we write something better can we do it?" I said yes, but you're turning down a hit. They quickly came back with "Please Please Me," and I must confess it knocked me out. They'd worked out all the little harmonies and it was super. I said that's great, you've got your first number one hit. I was so confident about it, and I gave "How Do You Do It" to Gerry, and that became number one too, so I was justified both ways. That was the beginning of them. MM: Did you ever think they'd be able to follow up "Please Please Me" with more of their compositions? MARTIN: It all happened so fast then, events moved so quickly. Brian was pressurising them all the time to write new material, and they were caught up in this success whirlwind, and they wanted to continue writing. They'd come to me and say "what do you think of this?" and that's how "From Me To You" happened. 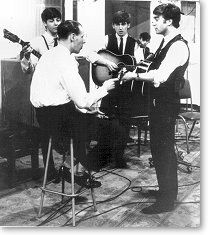 As soon as we'd made "Please Please Me" I decided to make an album very quickly, and I brought them down for just one day. We started at 10 o'clock in the morning and finished at 11 o'clock at night and made the first album. Brian was also caught up on this success thing, and he wanted to load me with a lot of other stuff then ... it was a kind of partnership: "I'll give you the raw material and you give me the goods and we'll sell it." It was a very happy year but it was terribly hard work. I was in the studios the whole time, and I've never worked so hard in my whole life. MM: When did the group's attitude to you start changing, and vice versa? I expect that "With The Beatles" and "Beatles For Sale" were made in much the same way as "Please Please Me," weren't they? MARTIN: Even though they'd written their own songs, they had them as songs rather than as records. They weren't thinking in terms of records ... they were thinking of a chorus, a middle eight and an ending. When I started off with them I'd organise their beginnings and endings and their solos. It seems terrible elementary now, but when they sang the song first I'd time the chorus, and when it came to one minute 20 seconds I'd say, "Right, it's not long enough - go back to the middle eight" or else we'd have a little guitar solo or a bit of piano. It was all dead simple, and gradually the collaboration grew. It was just the four of them and if there was any keyboard stuff I'd put it in. It wasn't until "Yesterday" that we started using other instruments. MM: When did you start noticing their use of unusual construction, like odd bars of 2/4 and so on? MARTIN: I can't really remember. They never noticed it at all. MM: You never tried to make them iron it out and write 32-bar songs? MARTIN: Not a bit, I recognised that those aberrations, so to speak, were part of them. It would have been silly to change them, because that would have destroyed their spirit. I don't think I ever quarrelled with them musically at all. the only time I ever really came to blows with them was over something quite different, which was a record sleeve. It was one that was never issued over here. They were dressed up as butchers, and it came out in America. It was their idea of a joke. MM: In the early days, did John and Paul really write together? MARTIN: Yes, but they also wrote separately. 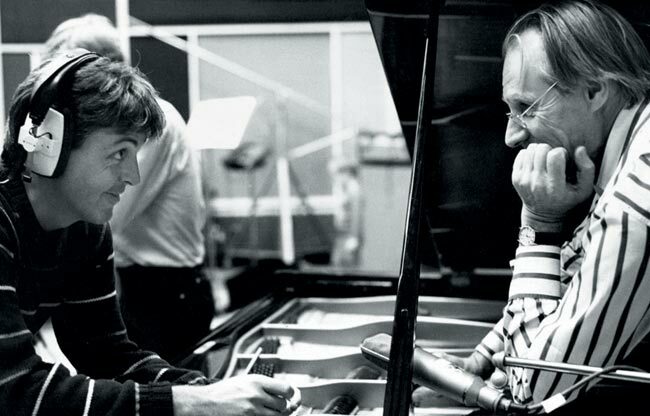 "Please Please Me" and "From Me To You" and "I Want To Hold Your Hand" were undoubtedly collaborative efforts. They'd sit down and literally construct the songs together. I can't remember the first individual songs, although obviously even before I met them they were writing individually, but if you go through them you can hear which of them are John-oriented and which are Paul-oriented. "Yesterday" is obviously Paul, and that's an interesting point because it was the first time we ever used anyone other than Beatles on a record. There was no one on that record but Paul and a string quartet. MM: How much part did you take in the creation of "Yesterday"? Presumably Paul wrote all the melody and lyric. MARTIN: Oh sure. What happened was that he had this song which'd been kicking around for a long time. He'd play it to me on the piano, and it was called "Scrambled Egg." He was looking for lyrics all the time, and we all thought it was a good tune. When he'd finished it and he wanted to record it, I said that I couldn't see what Ringo could do with a drumbeat on a song like this. I told him the best thing to do was to go down to the studio and just sing it, so he just played the guitar and sang. I honestly couldn't think what to do with it - except to put strings on it. Paul said "What ... Norrie Paramour stuff? Mantovani? No." Then I had the idea of using a string quartet, a very classical thing, and Paul thought it was a great idea. MM: It seemed like a big step at the time. MARTIN: It was. I spent a day with him, getting his ideas on how the strings should sound, and I went and wrote the score for the string quartet and recorded it. MM: Did you notice them growing apart, developing distinct personalities? MARTIN: Paul and John had their own identifiable styles: Paul was the syrupy one and John was the hard one. But the rift wasn't there then. They were really a unit. MM: Being in that highly-pressurised situation must have pushed them together. MM: Did Brian ever have anything to do with the actual music? MARTIN: Nothing at all. He was quite right not to. The relationship was fine - Brian was very much the businessman, fixing up all the dates and so on, and he had that tremendous air of ... a snooty air with people which sold the Beatles as being more important. He had a great manner, really. He liked to be considered a part of the music. In fact he was very hurt one day in the studio: the boys were downstairs and I was talking to them through an intercom. Brian picked up the mike and said, "Why don't you do such-and-such" and John said "Brian, you look after your money, and we'll look after our music." Brian flushed to the roots of his hair and never said any more. He was obviously very hurt by that. MM: "Rubber Soul" always seemed to me to be about their most "perfect" album - it's the last of the "live" albums, really. MARTIN: Yes, the last of the non-fabricated albums. I heard it again for the first time in ages while I was on holiday last year, and it sounded pretty good. MM: "Revolver" was a step away from that, into using the resources of the studio. Was that a conscious move? MARTIN: I think so. The boys were curious all the time about the music and the world around them, and they were constantly exploring. I was trying to tell them as much as I knew about it ... I'd spend some time with John, playing him some classical music, Ravel and so on, and it didn't come through to him very much. 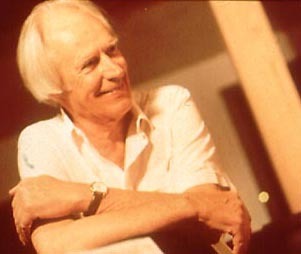 But they were into all sorts of things like Stockhausen ... they discovered him very quickly in those days, and "Tomorrow Never Knows" was obviously influenced by him. I'd been doing some electronic music before they came along anyway. I issued a single called "Time Beat" - d'you remember that? It was put out under the name of Ray Cathode, and I'd done it with the Radiophonics Workshop. MM: But did they discover it for themselves? 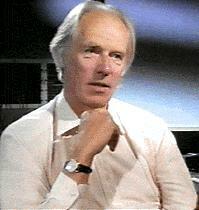 MARTIN: They discovered Stockhausen for themselves. I guess we talked a lot about things and it's very difficult to put your finger on who discovered what. "Tomorrow Never Knows" though ... they'd bought themselves tape-recorders and they'd started playing with them in their own homes ... I think Paul discovered it first ... they got into making little loops for themselves. On any tape recorder, if you cover the erase head and put on a loop of tape, you can put on a sound and if you switch it off after a few seconds it keeps going round and round, overdubbing itself. You can build up a funny whirling kind of sound, and by playing that at various speeds they got all these weird sounds. For "Tomorrow Never Knows" they all went away and made loops at various speeds, and brought them to me. I'd play them on a machine, keep some and discard others, and we eventually ended up with eight loops of different sounds. We'd already laid down a basic track of John's voice, and the drums, and bass I think, and we'd already put John's voice through a Leslie speaker, because he'd said to me "I want my voice to sound as though it is coming from a hill top in Tibet" - obviously he was hung up on the Tibetan Book of the Dead. He wanted a voice in which you could hear the words, but it had to have an ethereal effect, so I put it through the Leslie and he was knocked out with it. Then putting all these loops on, we got eight tape machines and put one loop on each, and I fed each of those machines into the control desk, so that by raising any of the faders at any moment you could bring up the sound of any one particular loop. We already had the rhythm track and the voice, so then we did a mix, and brought up any loop we fancied at any particular time. That's how we got that effect. MM: Did you see all these developments as being a good thing for pop music? MARTIN: Oh yes, because by this time we were so established that we could afford to take risks, and we could experiment. It was only one track on the whole album, and if people didn't like it - hard luck. It was an experiment, an indulgence if you like, and we thought it was worthwhile. MM: There seems to be some dispute about how "Eleanor Rigby" was created. Do you remember it taking shape? MARTIN: Not the song, but I do remember the recording taking place. I had assumed that it was all Paul ... in fact I do remember, actually at the recording Paul was missing a few lyrics, and wanting them, and going round asking people "What can we put in here?" and Neil and Mal and I were coming up with suggestions. Rather petty, really ... everyone contributed things occasionally. MM: What about the arrangement - much the same as "Yesterday"? MARTIN: It was rather more complicated, in that I took as my model some writing of an American film composer, he's got the same name as the guy who runs the Northern Dance Orchestra ... Bernard Herrman. MARTIN: That's right. 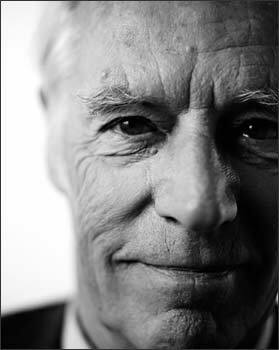 He'd written for a film called Fahrenheit 451, and the string writing in that was great. That was my model for "Eleanor Rigby" I worked a bit with Paul, getting his ideas on harmonies and so on, and that's how it evolved. It was comparatively easy because Paul was able to play the tune on the piano, and I could translate it for the strings in the style of Bernard Herrmann. MM: Did you consciously have to pull them together for it? MARTIN: No, I just had to be patient. You can't do much with a guy when he's giggling all the time. MM: Did it start off as just another album? MARTIN: Yes. It started off with "Strawberry Fields," and that wasn't all hung up. It was quite straightforward, and I love that, I still think it's one of the best things they've ever done, and it was very much John's song. This was when the two of them became very separated to my mind: "Strawberry Fields" and "Penny Lane" were done at the same time, but they were completely different. One was very much Paul and one was very much John. It was in November of that year, we started off with "Strawberry Fields" and then we did "When I'm 64" and then we did "Penny Lane" and then we had a break for Christmas. So that was the beginning of "Pepper" ... we needed a single out so we put those two songs out, otherwise, I guess they would have gone on the album, as did "When I'm 64." MM: In what sense do you feel that the songs on "Pepper" were the product of their involvement with acid and so on? MARTIN: It was the beginning of psychedelia, the imagery in their little minds. They were ready for it in the creative way, they wanted something to blossom anyway, and if they hadn't been on drugs, it's possible something like that would've happened, but not quite so flowery, maybe. Certainly all the attributes to drugs afterwards wee totally misplaced ... "Lucy in the sky with diamonds" honestly was a phrase that young Julian Lennon had come out with. The song itself. all that stuff about "floating downstream with garlands in your hair" obviously ... it's a good song. MARTIN: I'd dispute this with you ... was Salvador Dali ever on drugs? It's the same kind of surrealism. MM: What about things like "Mr Kite" and the sound effects? MARTIN: John got the idea of that from an actual poster - he often pinched things like that for his songs - and I thought it was a great idea. When he came to record it he said he wanted to convey the impression of sawdust in the ring, to give the idea of a fairground and a circus. So I started working out my electronic sounds to -make it just that. I got lots and lots of steam-organ sounds, genuine calliope noises, which are tapes of "Liberty Bell," Sousa marches, that kind of thing. I spent the morning with an engineer, put them all on one tape, and asked him to cut them up into sections 15 inches long, which is about a second in length. He did that and they were all in a row on the desk. I said "Now throw them in the air and pick 'em up and join 'em together." Inevitably some were backwards and some were forwards, and when we played it back it was a terrible mish-mash of sounds. That was fine, and we used it as a background noise. It was overlayed throughout the whole piece and then on top of that we put Mal Evans playing bass harmonica and both John and I playing organ, I was on a Hammond and he was on a Lowrey. He was playing the tune and I was playing the harmonies, and the runs, because he said he wanted kind of "swooping noises" on it. To get that I played chromatic runs going up and down on the Hammond, at half speed. We slowed the tape down, and went down an octave. I was quite pleased with that ... it was a sound picture thing and I was doing really what I'd been doing with Peter Sellers, building up a little picture. Most of John's writing at that time was coming from little observations, like seeing the poster. The "Day In The Life" thing, the controversial bit about holes in the road which a lot of American journalists thought were puncture marks in your skin, was an extract from the Daily Mail. MM: There's a little legend that says that, although John and Paul wrote the basic components of "Day In The Life," you were responsible for picking up the pieces and sticking them together. MARTIN: No, let's explain that. John had this song, which started off with his observation, and his part was the beginning and end, and Paul's was the middle bit. We started recording it with Paul on piano and John on guitar, and we decided we needed another riff in it, and Paul said, "Well, I've got this song - 'Got Up, got out of bed'," ... and he was going to make that a separate song. He said, "You can use it if you like, put it in your one. Will it fit?" They thoight about it for a bit and decided it would work, and they wanted something differentin it but didn't know what. They decided that they were going to pit a lot of just rhythm in it, and add something later. So I said let's make it a definite number of bars, let's have 24 bars of just rhythm in two places, and we'll decide what to do with them later. They said "How are we going to know it's 24 bars, because it's a long time?" So we had Mal standing by the pianocounting "One ... two ... three" and in fact he had an alarm clock, because he was timing the thing as well, and it actually went off. On the record you can hear Mal saying "21 ... 22 .l.." if you listen. When we'd done it I asked them what they were going to do with those bloody great gaps. Paul said he wanted a symphony orchestra, and I said don't be silly, Paul, it's all right having 98 men, but you can do it with a smaller amount. He said, "I want a symphony orchestra to freak out." So I said "If you really want one, let me write something for it." He said, "No, I don't want you to. If you write it, it'll be all you. Let's have just something freaking out." I said let's be practical, you can't get an orchestra in there and say "Freak out, fellers," because nothing would happen. hey'd just look round embarrassed and make a few funny noises. So I booked a 41-piece orchestra, half the normal symphony orchestra, and I spent some time with Paul and John. i wrote out the obvious underlying harmonies, and during the main 24-bar sections John and Paul suggested that we should have a tremendous shreik, starting out quietly and finishing up with a tremendous noise? So I took each instrument in the orchestra and at the beginning of the 24 bars I wrote down their lowest note, whatever it was so that the cello for instance had a bottom C, and at the end of the 24 bars, I gave them their highest note related to the chord of E. And throughout the 24 bars I just wrote "poco-a-poco gliss" and when it came to the session I told the musicians that they had to slide very gradually up and those people in the woodwind who need to take breaths should take them at random. It was just a gentle slither. But when we came to do it, the boys said they wanted to make a real event of it. So they got all their friends to come along and dress up and at that time Mick and Marianne Faithfull came along and all their Apple Shop friends - the Dutch people - and there must have been about 40 of them, all freaking out with joss-sticks. Paul said "We're going to be in our flowers but we don't expect you to do that because we know you're not that kind of person." I said "Thank you very much." He said, "But I want you to wear evening dress, and the orchestra too." So I booked the orchestra in evening dress, and when it came to the point Paul had brought a lot of carnival gear - funny hats and false noses - and I distributed them among the orchestra. I wore a Cyrano de Bergerac nose myself. Eric Gruneberg who's a great fiddle-player selected a gorilla's paw for his bow-hand, which was lovely. It was great fun. MM: What was the pace of your life like during the years you were recording the Beatles? MARTIN: I never knew when I'd be in the studio. As like as not it'd be ten o'clockone morning and "We're recording at eight o'clock tonight." No question of "Can you be there?" It was "You will be there." So one was constantly in a state of preparedness, and this was unfortunate where other artists were concerned. Up to the point of "Let It Be," there was only one orchestration that was ever done by anybody else apart from me. I had conceitedly thought it was because they liked my style of scoring. I thought I was better than anybody else and I was very upset once when Paul rang me up and said that he wanted to do a score on a song that we'd been working together on anyway ... I knew the song pretty well. He said "Come at two o'clock this afternoon," and I said, "I'm sorry Paul , I can't." He said "Why not?" and I said "I've got something else on. I'm recording Cilla." I said I'd go round and see him the next day. Apparently he got Mike Leander to turn up at two o'clock ... that's the only time he worked with anybody else. MM: Which song was it? MARTIN: "She's Leaving Home." Mike gave me the score, I booked the musicians, I altered the rhythm a bit, but not very much. It was basically Mike's score. I was rather upset by the peremptory way in which it was done. But it wouldn't have happened like that in the early days. MM: John recently said something about you: "Show me some of George Martin's music. I'd like to hear some." How do you feel when one of them says something like that about you? MARTIN: That's silly, of course. I guess I feel sorry for him, because he's obviously schizophrenic in that respect. He must have a split mind ... either he doesn't mean it, or if he does mean it he can't be in a normal state of mind at that time. The contrary thing is that in June of last year I was in the States and I did the David Frost Show, with Diahann Carroll. Obviously, we talked about the Beatles, and I ended up plating the piano with Diahann singing ... one of those terrible American showbiz things ... it appeared to be quite a happy show and I didn't think any more about it. Then about six weeks after I got back, I had a postcard from the Beverly Hills Hotel, written by John in his own fair hand, saying that he caught the Frost show, thought it was great, and it was so nice of me to say such nice things about him and how he hoped that my wife and children were well and Love from John and Yoko. That was the last time I heard from him, and that's the other side of the coin. He'd probably hate people to know that he was that sentimental. MM: What was your opinion of the Beatles' involvement with the Maharishi? Did you feel that it was sidetracking them? MARTIN: No ... they tried to convince me that I should take it up, but what they couldn't appreciate was that they were going through most of the things that people go through when they're adolescents anyway. They were suddenly discovering new things ... religion, mathematic arguments, the universe ... as though no one else had discovered it before. I said "It's all right for people who like that sort of thing, but it's not for me, I'd rather go down to my cottage in the country and look at my pigs." So they did their little thing ... I didn't honestly think it would last, and it didn't. MM: The next landmark must be the White Album which was put down hard although I think there's a lot of good stuff on it. MARTIN: I didn't like it because there was too much material. They'd written an awful lot of stuff while they were out in India, and they'd come back just wanting to put them down. I said "Okay let's put them down and issue the best." But when we'd got them all down they didn't want to ditch any of them, they wanted to make it a double album. There was such a varied selection of styles ... there were obviously John songs and Paul songs and George songs ... and there was no unity in the thing. After the unity of "Pepper" ... you know, "Pepper" became a unit only when we put it together. It was designed that way. It wasn't until I started piecing it together and cutting in sound effects and so on that it really became a whole. I thought this was a good thing, and I was rather sad when we did the White Album that we'd chucked that out of the window. 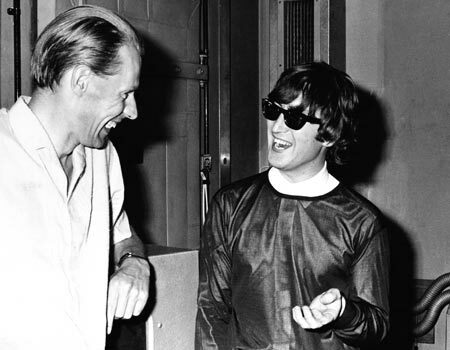 I still wanted to do a coherent work, and I didn't really persuade them to get down to it until "Abbey Road," and even then John was very against that. It was only Paul who really wantedthe unifying bit. Curiously enough, I like the last bit of the White Album - "Revolution No 9" - but a lot of people slated us for that. MM: Do you remember how that was made? MARTIN: It was just an extension of "Tomorrow Never Knows," a similar kind of thing with various tapes, and I guess this was largely influenced by Yoko, because it was her kind of scene. But again I was painting a picture in sound, and if you sat in front of the speakers you just lost yourself in stereo. All sorts of things are happening in there: you can see people running all over the place and fires burning, it was real imagery in sound. It was funny in places too, but I suppose it went on a bit long. MARTIN: That was a great one, tremendous. MM: How did you get the scratchy 78 effect? MARTIN: Something like that ... and that was the headline over a picture of a man with a gun in his hands. I showed it to John, and he made a song of it. MM: To me, it's also the album where George starts to blossom as a composer. MARTIN: Yes. He'd been awfully poor up to then, actually ... some of the stuff he'd written was dead boring. The impression sometimes given is that we put him down ... I don't think we ever did that, but possibly we didn't encourage him enough. MM: Was he given an allocation of two songs per album? MARTIN: Not really. He'd write, with difficulty, and he'd bring them and we'd say, "Okay we'll put them on the album then." But it was that way ... we wouldn't say, "What've you got then, George?" We'd say, "Oh, you've got some more have you?" I must say that looking back it was a bit hard on him, but it was natural because the others were so talented. It was always slightly condescending, and it was a similar thing with Ringo. He'd come along with "Octopus's Garden" or something ... he always wanted to do something, because he was left out in the cold. It wasn't until recently that George has really come through, I suppose that "Something" was his breakthrough. 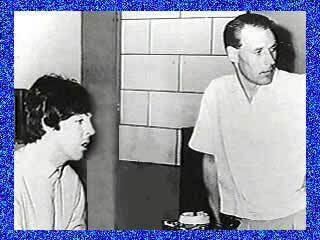 MM: What did you have to do with the recording of "Let It Be?" MARTIN: Yes, I produced the whole album originally, and got a great shock when I found it "re-produced" ... or over-produced, as I put it. MM: What's your opinion of what Spector did to it? MARTIN: It was an unhappy album from the beginning, because this really was the time of dissent. It was before "Abbey Road," and I really thought that "Let It Be" was going to be that last album any of us did. They were all fighting like mad. John insisted that it was going to be a natural album, and he didn't want any faking, any of the "Pepper" stuff, any production. He said to me "Your job is to make sure that we get a good sound. I don't want editing or overdubs of voices or instruments. It's got to be like it is." So we made it like that, and it was very tedious because they kept repeating the same things over and over again, and it's very difficult when you get to the 27th take to work out whether number 13 was better than number 19. None of it was ever very good, none of it was perfect - it would have been if you could have edited things together. It had this rawness, and I could quite see the advantage of it, so we made up this album which was an honest album, and that was it. It was left lying, and we recorded "Abbey Road," which was back to square one because we were able to produce it. I was much happier then, and after that. MM: Did you think when you were making "Abbey Road" that it was going to be the last album? MARTIN: No, I really didn't. They'd got back, they were much happier with themselves. It was very much more of a produced album ... we used a Moog for the first time, on George's "Here Comes The Sun." Everybody seemed to be working hard, and we'd got things nicely organised. It wasn't until after that that things started happening badly. I knew that John was going in the studios, doing some work on "Let It Be," but I understood that as they were making a film of it, they were doing some film tracks. When the record finally came out, I got a hell of a shock. MM: You didn't know anything about it? MARTIN: Nothing. Neither did Paul, and Paul wrote to me to say that he was pretty appalled, if you'll forgive the pun. All the lush un-Beatle-like orchestrations with harps and choirs in the background. And it was so contrary to what John asked for in the first place. MM: Could you tell me what you think of what each one has done individually since the last Beatles record? MARTIN: I have great admiration for George. He's done tremendously because it's a sort of devotion to duty as far as he's concerned. We forced him into being a loner, I guess ... he could never collaborate with anybody in his writing and therefore when the split came he had more strength because he was forced to be alone. He learned an awful lot about producing, studio techniques, and so on, so that he was able ... obviously, any one of them had the power - because they had the money - to spend as much time in the recording studio as they liked, and I know that when George made his album he spent six months doing nothing but overdubbing his own voice 16 times and producing his album. To have the tenacity to do that in itself is something of an achievement, but to go along and actually produce good sounds and good music and good lyrics with it is tremendous. I'm full of admiration for that. I think the other two have suffered by comparison, because they've each indulged themselves in their own way. John's bebome more obvious in a way ... "Power To The People" is a rehash of "Give Peace A Chance," and it isn't really very good. It doesn't have the intensity that John's capable of. Paul, similarly with his first album ... it was nice enough, but very much a home-made affair, and very much a little family affair. I don't think he ever really rated it as being as important as the stuff he'd done before. I don't think Linda is a substitute for John Lennon, any more than Yoko is a substitute for Paul McCartney.